The Summary tab lets you specify which game or application your profile is for, and enter any notes for it. 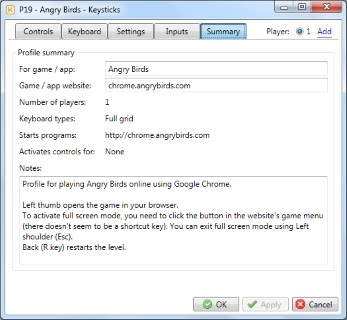 It also shows the number of players and which keyboard types, program actions and control set activations the profile contains. When you are browsing profiles, this summary information is shown in the Profile Preview window to give an overview of the profile, so it's helpful to update the summary before you share your profile in the Download Area. Microsoft, Xbox 360, PowerPoint and Windows are either registered trademarks or trademarks of Microsoft Corporation in the United States and/or other countries.